Today I had a morning appointment. After I came home, I had lunch, took a nap, and then migrated all sorts of toys to the patio. My neck got sunburned! 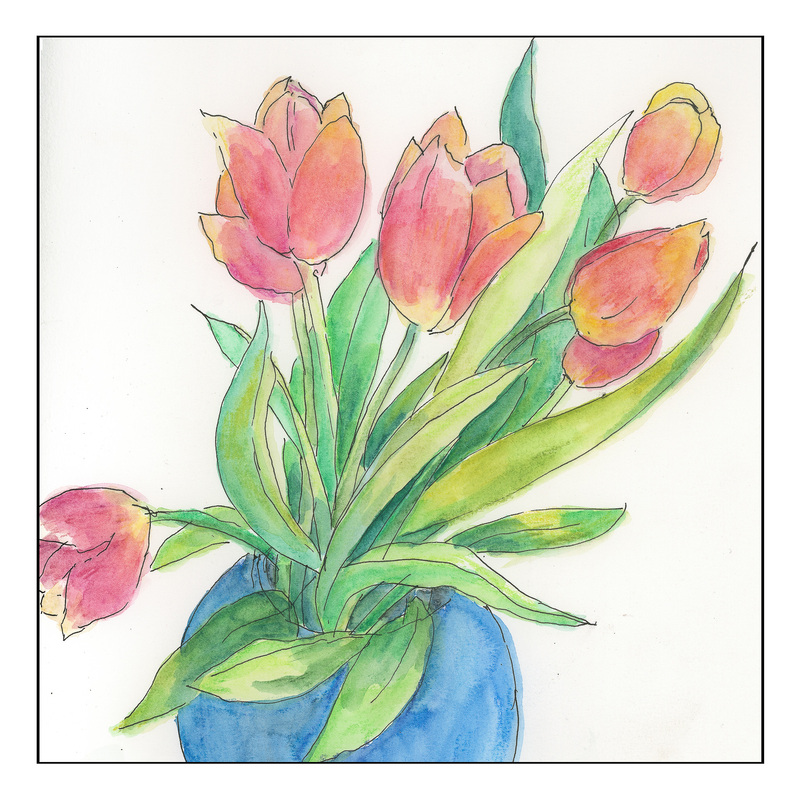 Amongst the toys were a set of Albrecht Durer watercolor pencils by Caran D’Arche, a bowl of tulips, a brush pen, ink pen, and paper. This is probably the third time I have used these pencils, and this time around I am happier with the results. I have watched a few videos from YouTube on using them, and the tips were worthwhile. For example, layering and laying down glazes to get better results. Being patient! My own painting skills are better than they used to be, so my sense of light / dark is not as klutzy as it was a few months ago. And, without having the need to produce some work of art, I was a lot more relaxed. Of course, sitting in the sun didn’t hurt any. In general, my own experience with watercolor pencils is that they are not strong enough in color to produce the type of strong contrast I seem to prefer visually. Maybe it’s just my limited experience. Nonetheless, I am happy with the results demonstrated in this little study. Looks like you had a lovely time…beautiful.